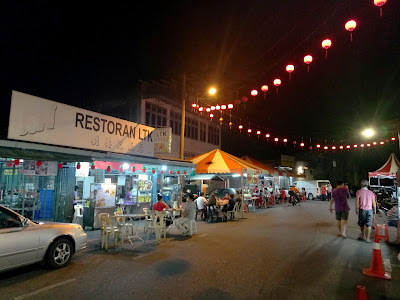 Pekan Cina was formerly the heart of Alor Setar's hawker scene. While most food stalls at Hai Tao Ki (海头街) have moved to a new location, several nighttime stalls remained along Jalan Dato Doktor Cheah Toon Lok. This one-way street is known locally as "Bak Beh" (猪肉街) due to a butchery here. 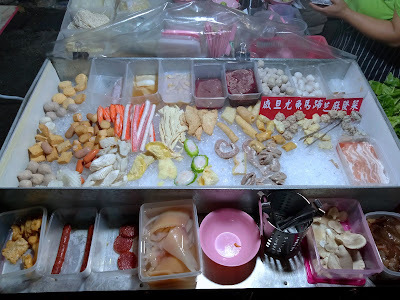 One of the stalls along Bak Beh sells Teochew Steamed Tua Ban (潮州蒸大板). It is operated by an elderly couple. Tua ban is a flat noodle that resembles koay teow. 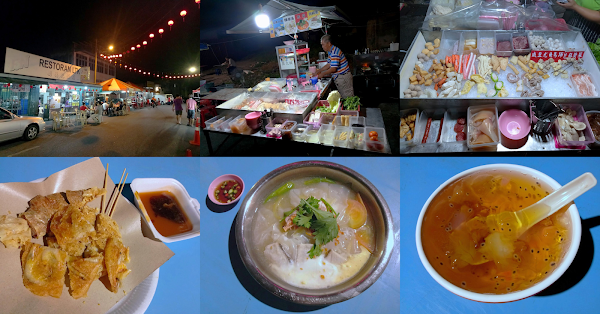 In addition, the stall also serves koay teow soup (粿条汤), tom yum (东炎) and minced pork porridge (肉碎粥). 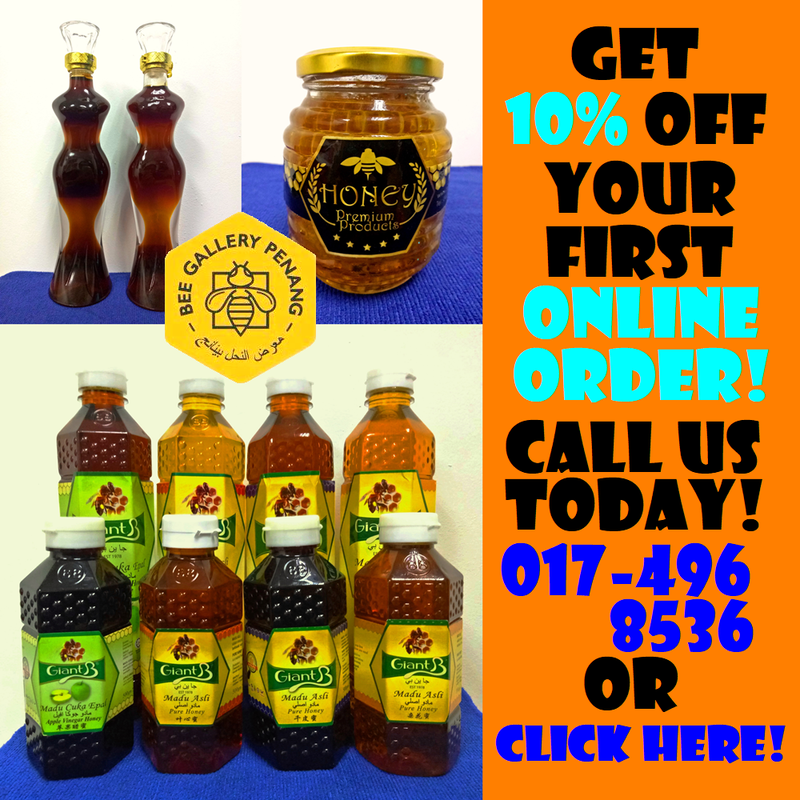 Customers may add more ingredients, which are charged separately. Choices include sliced pork, cuttlefish, fish balls, mushrooms, tofu, yong tau foo (酿豆腐) and more. Food is prepared to order. 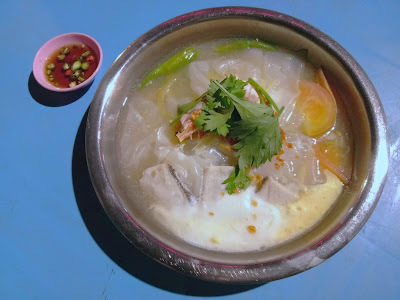 Tua ban is usually stir-fried, so it is interesting to see how Steamed Tua Ban (现蒸大板, RM7.00) fares. Although steaming does not infuse much "wok hei" (镬气) like stir-frying, the noodle has a soft texture that makes it quite delectable. I also appreciate the tangy taste of tomatoes. The dish contains bird's eye chili (小辣椒), so be careful if you are not used to eating spicy food. There is a stall nearby that sells Lor Bak (卤肉). Our choices this evening are pork rolls (肉卷, RM1.50), prawn fritters (虾煎, RM1.50) and fried taro (芋头煎, RM2.00). The last one is particularly delicious. Starchy sauce and chili sauce are provided as condiments. 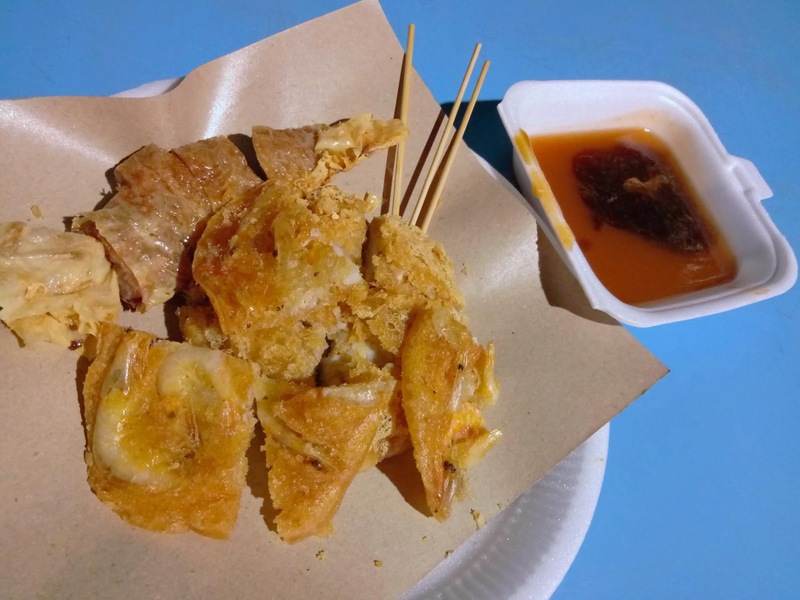 The waiting time for Lor Bak is particularly long because the hawker cooks the food items meticulously. 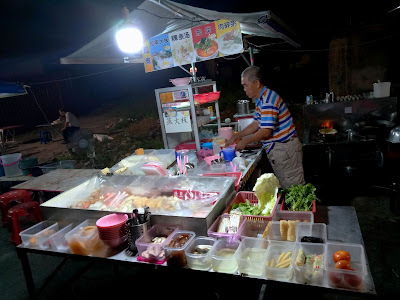 Another stall sells drinks and desserts such as Si Koh T'ng (四果汤). 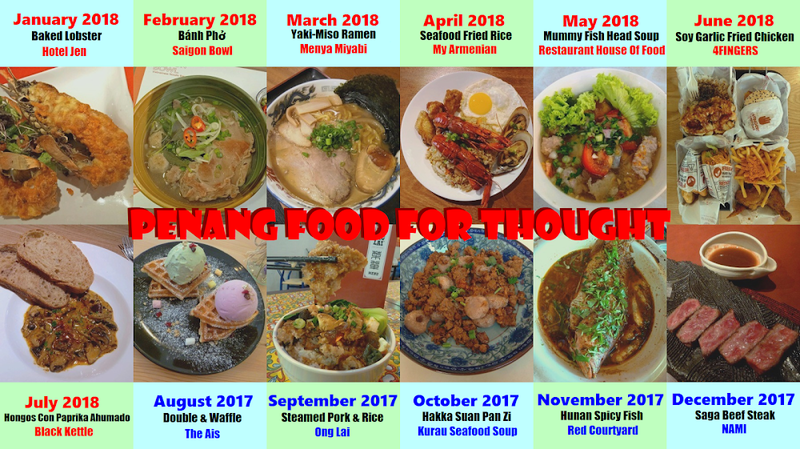 Si Koh T'ng is a traditional Hokkien dessert that can be served hot or cold. 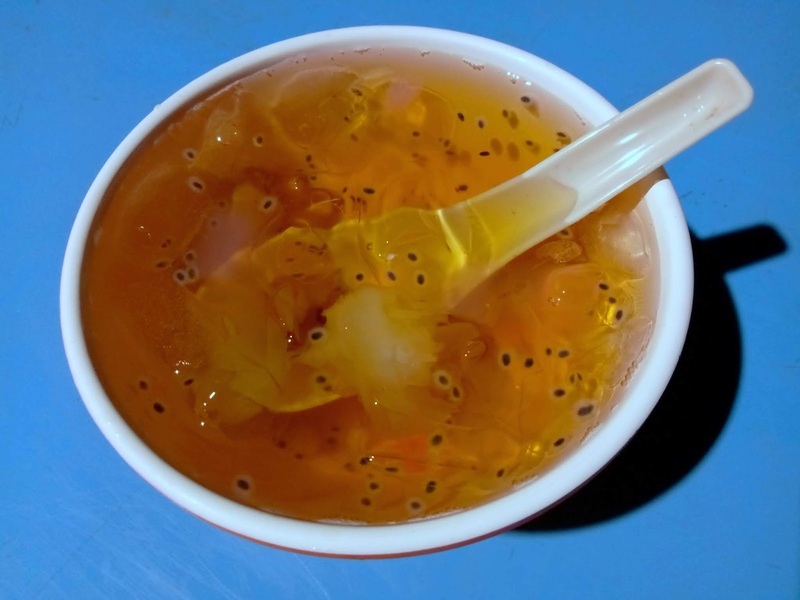 The sweet soup contains lotus seeds (莲子), longan (龙眼), snow fungus (银耳), barley (薏米) and basil seeds (兰香子). I find this dessert refreshing indeed.